Highly recommend this hotel. The staff were wonderful and helpful. Hotel is in a great location, in between Norte Dame and the Louvre so able to walk to both. Also metro station was across the street, making it easy to get to the further sites. Was in Paris to celebrate my sisters birthday, the hotel staff sent up a box of chocolate and a birthday card for her, it was a very pleasant surprise. I would definitely stay here again. The room we had was so different from the picture. It was quiet old and didn't get to see the view of seine river from our room which is quiet disappointing. But I was happy with the early check in. Traveled to hotel from Los Angeles for a four night stay during Thanksgiving week. We recommend it. The location is ideal and the hotel is fantastic. We would stay there again without question. Perfect location if you want to be able to walk to all the major tourist sites. As others have stated, the carpet really could use replacing. Bed wasn't particularly comfortable and everything seemed to have an odd odor (sweet smell pumped into the hallways, linens smelled slightly...mildewy?). Location of room will determine level of noise. Our was on a corner of the main road and a side road. We didn't hear regular noise but did hear the trash trucks a number of mornings around 6:45 am. Overall, it was nice enough and in a great location for a first visit where we were seeing so many major sites. Great location, beautiful property, and spacious room. We would definitely stay at Citadines again. Good location but the hotel is pretty run down. Staff is not the friendliest. Definitely not worth the high rates they charge. I had much higher hopes. We stayed here for just over a week and would go back without thinking about it twice. We had countless positive experiences with the manager and staff who helped us make our stay comfortable and memorable. Yes the rooms could use a slight update and the hallways upstairs smell oddly like marshmallows but those are small exceptions to a great property - especially if you are traveling with kids and prioritize room size/space and location over amenities/finishes. The rooms were well designed and had everything needed to make our stay comfortable. There were slippers, an umbrella, a kitchen with all accoutrements, and toiletries in the bathroom. There was a coffee machine downstairs so we could have coffee drinks at any time of the day. There was also a water dispenser so we could fill our water bottles. There was even a small lending library and some children’s toys. The hotel was very close to the st Michel metro and many sites. A great value for the money. Friendly, helpful service. Safe and clean. Situated in the center of all attractions. Spacious, beverages available 24/7 (coffe, tea, water, hot chocolate). AC stopped working in the morning of check out day. We didn't try hotels breakfast, got croissants from nearby bakery, cooked ourself. Convenient location. Great central location! Very comfortable! Clean and quiet! This hotels was so convince located. Close to everything, restaurant, landmark. The front desk clerk always nice and smiley. We went during a hot summer week and the air conditioner was in the lower setting and it was hot. We request a high floor room so we were in the top floor so it was hotter. The manager brought us a fan and that was really nice. If i return to Paris I will stay again at this place. In the lobby they have a wonderful coffee machine and that was super nice. Everything in the kitchen work and was really clean. The breakfast was also good and convinience. 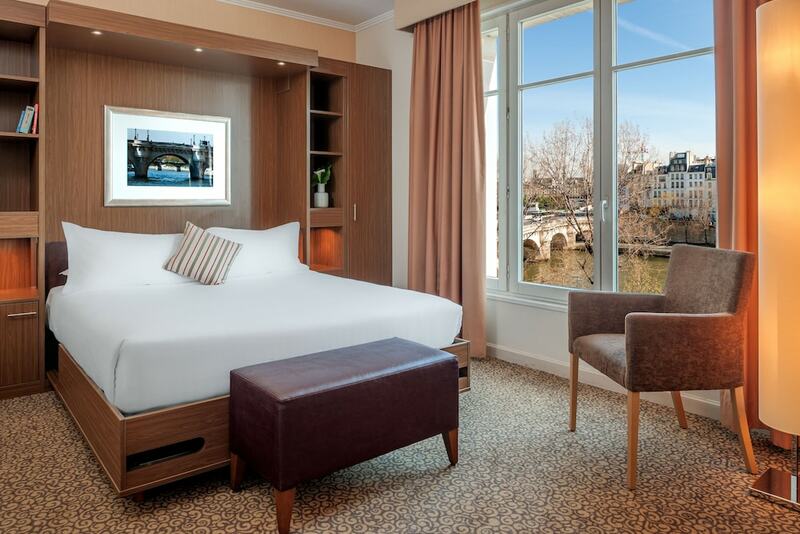 Located in Paris City Centre, Citadines Apart'hotel Saint-Germain-des-Prés Paris is adjacent to Pont Neuf and within a 5-minute walk of other popular sights like Ile de la Cite. This 204-room, 4-star residence welcomes guests with in-room amenities like kitchenettes, refrigerators, and microwaves. Start each morning with continental breakfast, available for a fee from 7 AM to 10:30 AM. Guests of Citadines Apart'hotel Saint-Germain-des-Prés Paris enjoy features like a 24-hour fitness center, free WiFi in public areas, and laundry facilities. Self parking is offered for EUR 35 per day. The front desk has multilingual staff on hand 24/7 to help with securing valuables, luggage storage, and dry cleaning/laundry. This family-friendly residence also has a TV in a common area. Thank you for your valuable feedback. We are happy to hear that you have enjoyed our facilities and service. We regret that this incident left you with a negative impression. As there may be other factors surrounding this incident, we would appreciate it if you could please contact us by phone or email so that we can investigate this further and address the situation appropriately. We look forward to hearing from you, giving us another opportunity to serve you better. Thank you for staying with Citadines.we look forward to welcoming you again. kindest regards. Thank you for taking the time to post this review. We are naturally disappointed to learn that we were not able to make your stay a comfortable experience. We will continue our improvements efforts to the pleasure of our guest. The key sensor in the elevator is only as security purpose and to prevent fraudulent person coming from outside to access the floors. We hope you will reconsidet staying with us, giving us a chance to serve you better. Recreation features at Citadines Apart'hotel Saint-Germain-des-Prés Paris include a 24-hour fitness center. The preferred airport is Paris (CDG-Roissy-Charles de Gaulle).